Times Square at midnight, New Year's Eve. Jewish New Year. A most wretched hive of scum and villainy. Originally named after the New York Times Sunday Styles section, it consequently became infamous as the the dirtiest, sexiest, and crimeiest area of Manhattan. 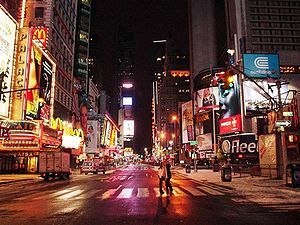 In its long history, the location has played home to multiple McDonald's (some with fancy menu screens), the Naked Cowboy, a Cold Stone Creamery, at least three TGI Friday's, a particularly wince-inducing film involving Madonna and some of the most dull Broadway performances of all time. Under Rudy Giuliani's reign as mayor the area was drastically disinfected, and the more notorious skin shows and lunch counters relocated to Queens. It was only later when the true identity of Batman was revealed to actually be Giuliani that this move was really understood. It had confounded most New Yorkers at the time, who had fought hard to keep the suburban values of wholesomeness and decency out of the city. Nowadays, this tawdry landmark displays more lights and billboards than ever. Surprisingly however, pornographic imagery in the area is as abundant as ever, albeit of a more product-oriented nature. Indeed Times Square has become a Mecca to the consumer and thousands of people come from all around the world to loll around and stare slack-jawed at the endless procession of shiny expensive objects touted on giant screens towering overhead. Travelling to Times Square has become an important religious duty for many Americans and The Man often grants a temporary freedom to the drones he employs to allow them to walk the many miles from Dudsville, Iowa or Stinkpot, Georgia to Times Square, where they may pay homage to the latest SUV or pretty sun hat. Local residents know better than to ever enter the area lest they be assaulted by the glare and eventually give in to the emissaries of the nearby Scientology branch. They choose to remain cowering in their filthy holes waiting for night to fall so they may feast upon the dead. If you should find yourself caught out after dark in New York, try and find Charlton Heston who runs an outreach center and monkey awareness center for tourists in Times Square. Overpriced merchandise and showy NYPD antics are typical of this bestial common, and most would gain nothing from entering its borders. The adventurous soul is advised to bring plenty of warm clothing and US currency, or items to barter for freedom – gold watches and doubloons are most popular. If suffering from prolonged exposure, flush the affected area immediately for 1-2 hours with cold water, and contact your local Poison Control Center. This page was last edited on 1 March 2012, at 22:34.